We had just parked at the little parking area by Peter House Farm when a couple of coaches pulled in and out poured the pupils of a few classes from a primary school, with their teachers and assistants trying to get them into some sort of order. One of the teachers looked over at us and said “I bet you’re wishing you had chosen a different day now, aren’t you?” Well no I wasn’t, because its good to see youngsters being given this sort of experience, but what I was really wishing was that either we had arrived a little earlier or them a little later. As it was, by the time we were kitted up they had already got under way, and so we spent the first bit of the walk looking at a long, and well spread out line of small groups of kids as they wound their way up the path, yelling at the tops of their voices. Consequently I didn’t take any photos until we finally got past every last one of them. 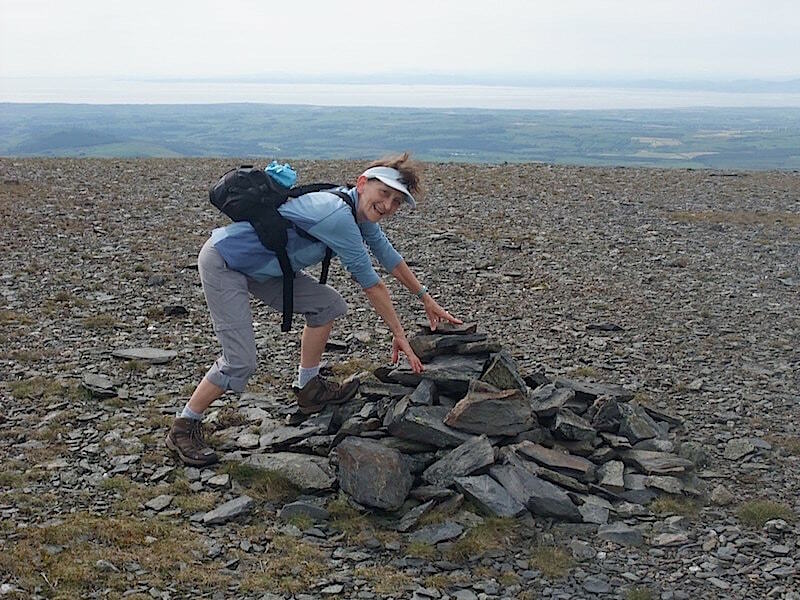 This is the first photo I took when we reached the summit of Great Calva. 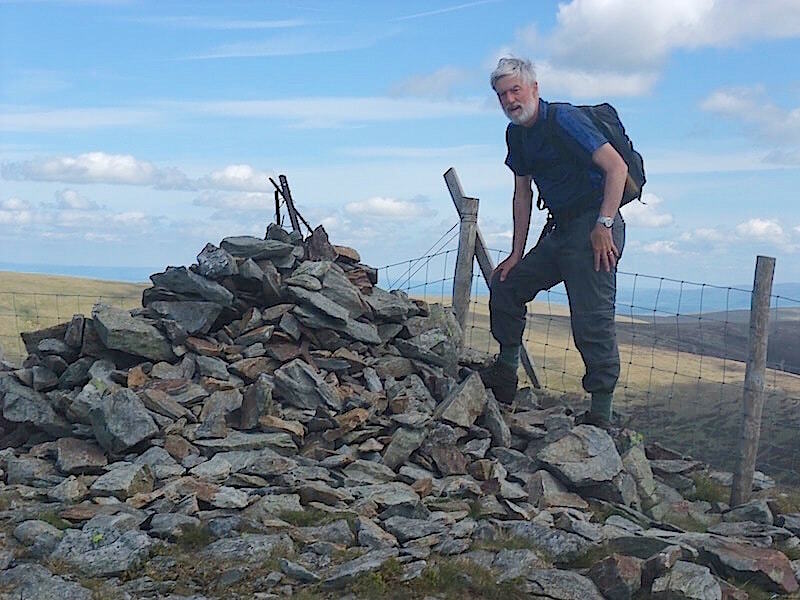 Great Calva summit cairn again. Its a lovely day but its very warm and muggy and there is absolutely nothing by way of a breath of wind to cool us down, even up here. 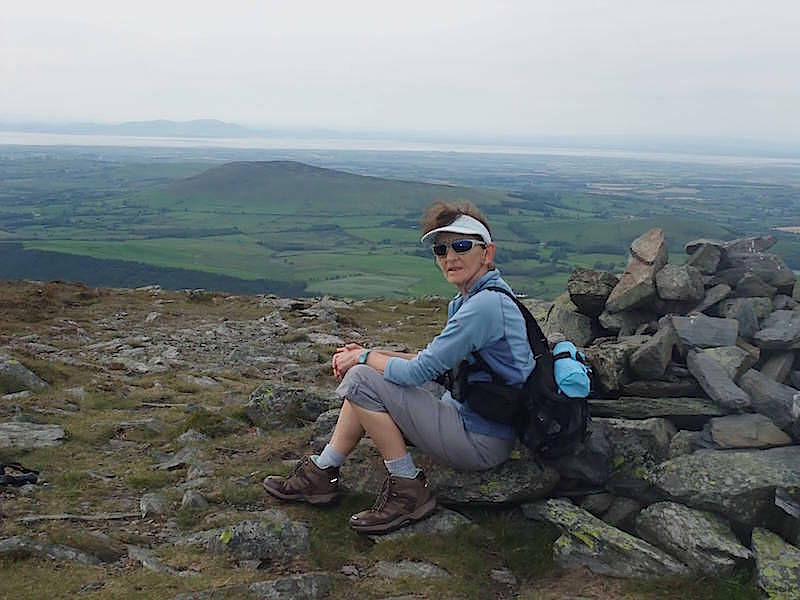 We had a short refreshment stop while we were up here to take advantage of a little shelter, complete with the luxury and comfort of a wooden bench seat, to enjoy this fantastic view of Lonscale Fell opposite us. 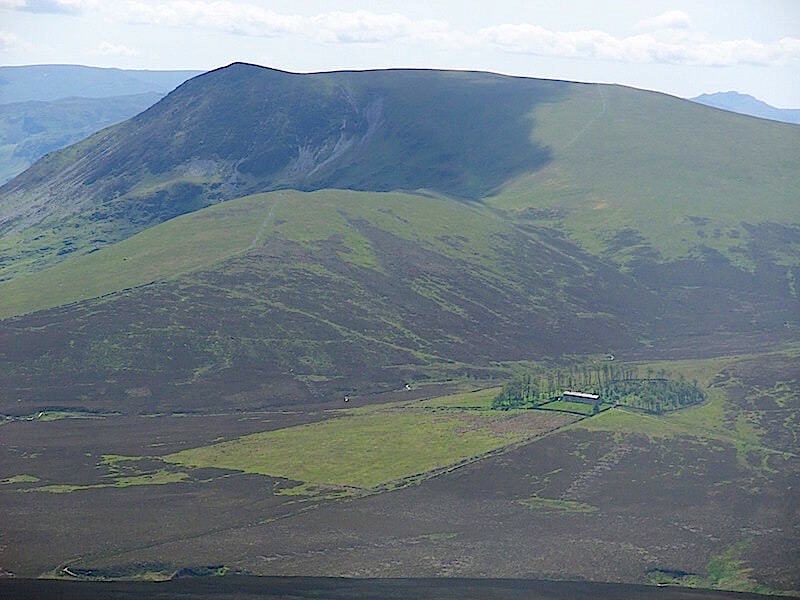 The building, called Skiddaw House, in the trees below was where the party of children mentioned earlier was making for and where they would be staying overnight. 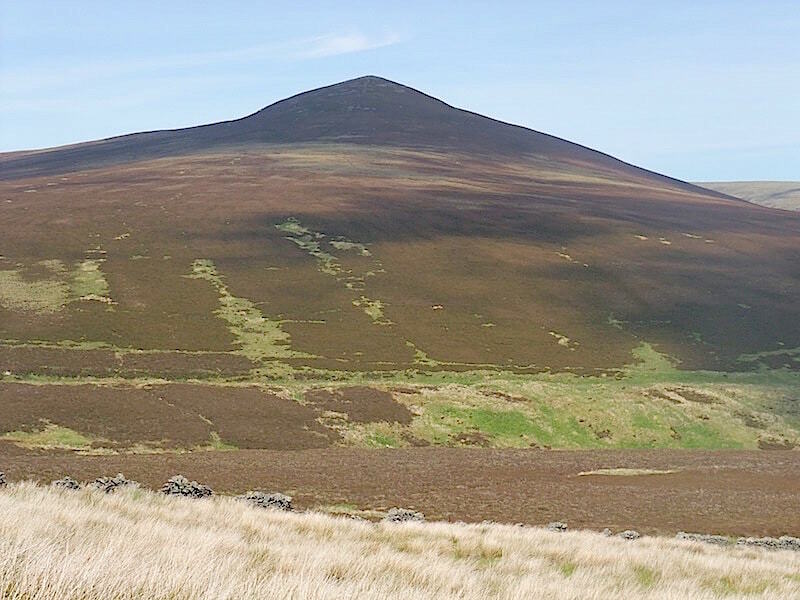 Lonscale Fell is where we are heading next and on the grassy slopes above Skiddaw House you can just make out the path we will be using. It doesn’t look it but it is a very steep climb which will probably feel even steeper in today’s hot conditions. 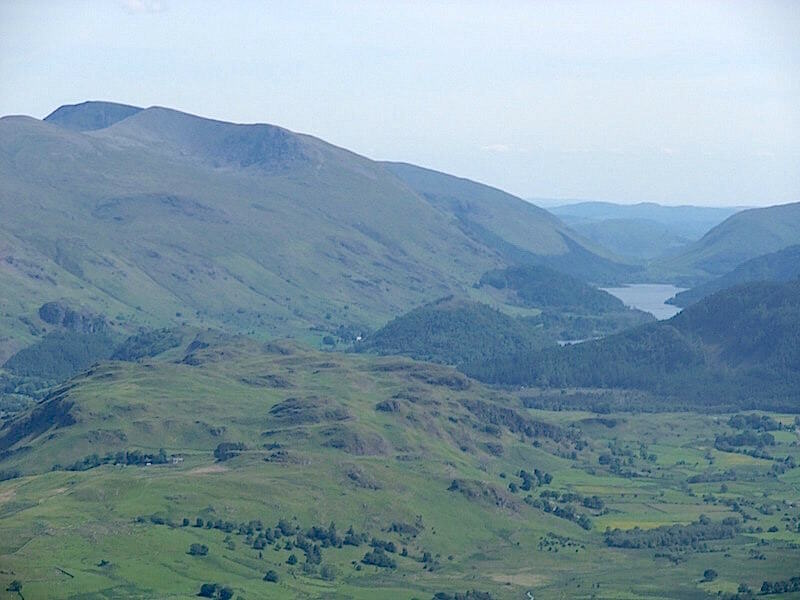 A rather hazy close up from Great Calva showing a little bit of Thirlmere over on the right with Helvellyn, the darkest and highest fell on the left skyline. 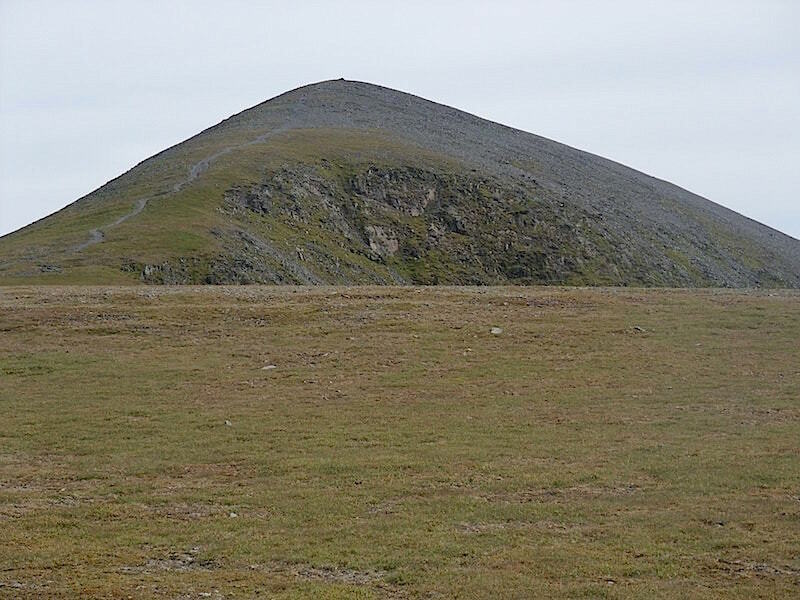 A look back up at Great Calva now that we’re back down on the path to Skiddaw House. 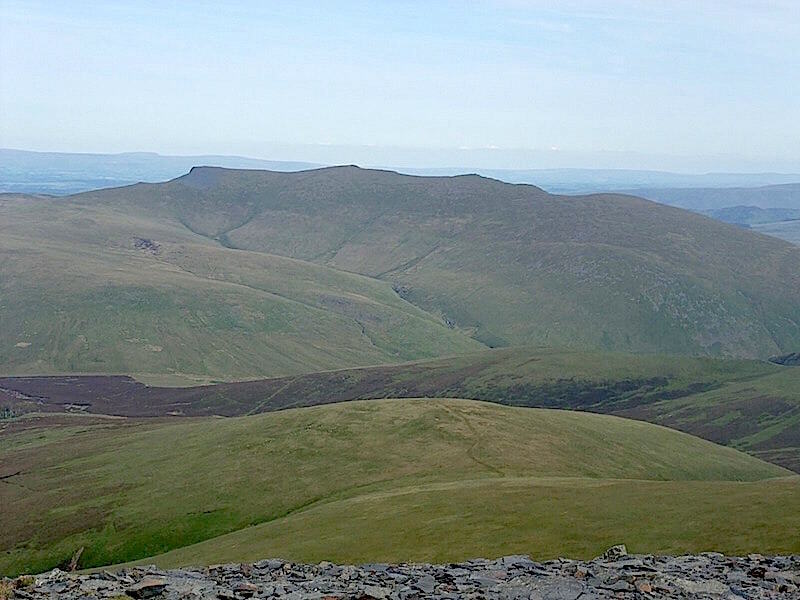 From the Skiddaw House path a closer look at the distinctive peak of Lonscale Fell. A brow mopping stop on the climb up Lonscale Fell and a chance to take a close up shot along Thirlmere. 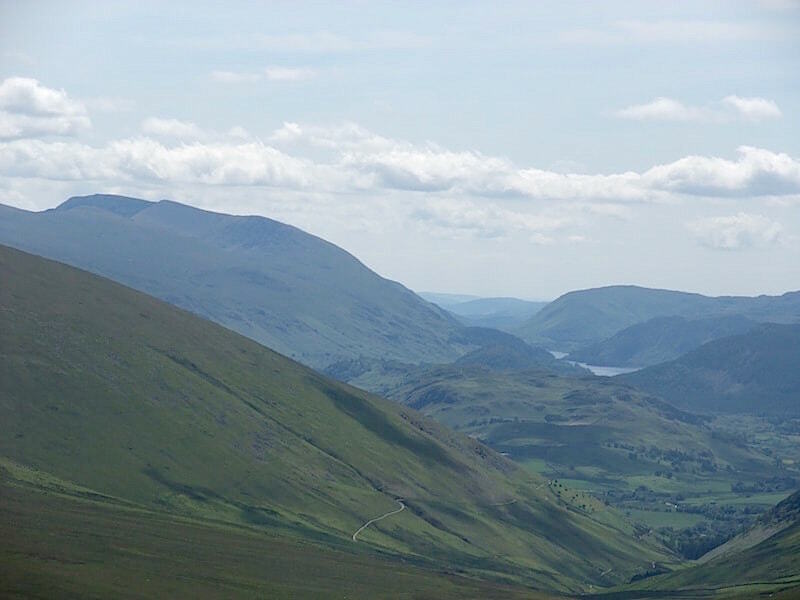 There’s a bit more detail showing on the Helvellyn side of the water over on the left. 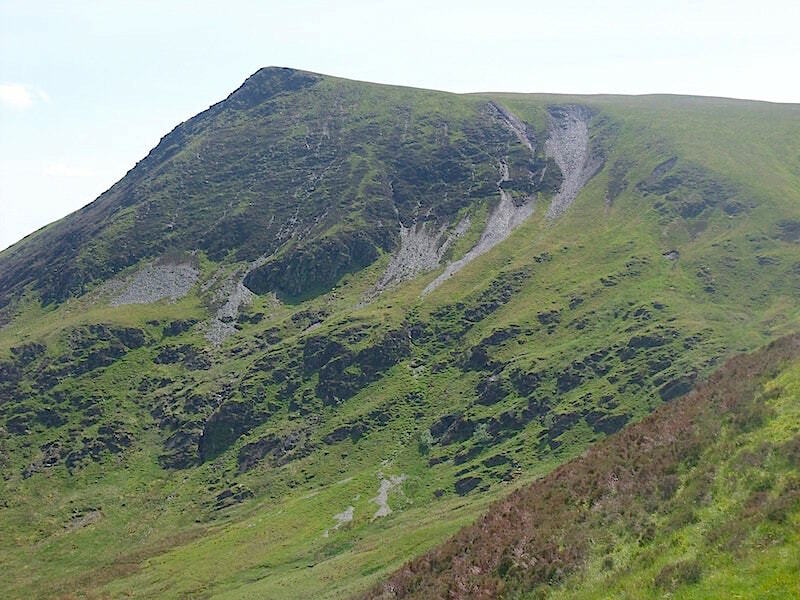 The dark, curved shape sticking out above everything else is Helvellyn, below and to the right of it is Helvellyn Lower Man which sweeps down to the rocky area of Brown Cove Crags. The basin shaped area below these two is Brown Cove. Well, we made it but there were quite a few stops along the way. 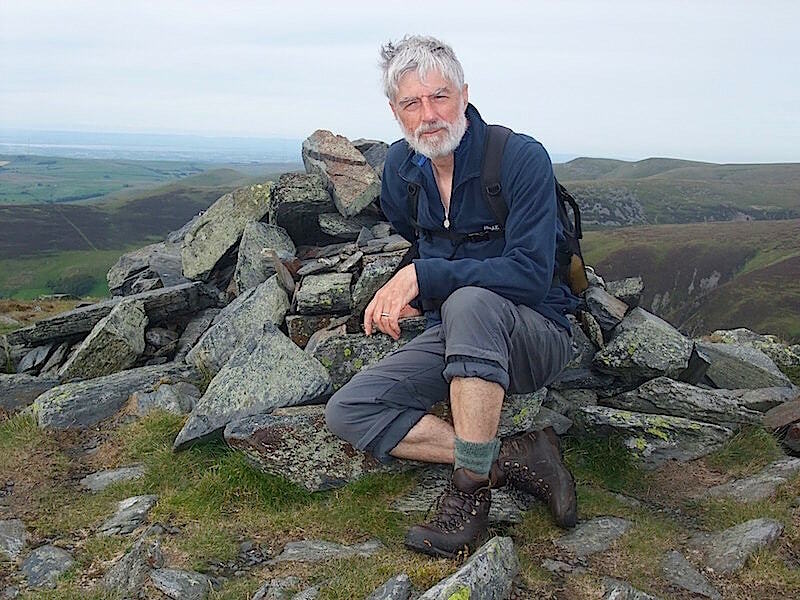 High temperatures and steep hills are not a comfortable combination, and quite a number of walkers had downed their packs and were just sitting around doing nothing in particular. 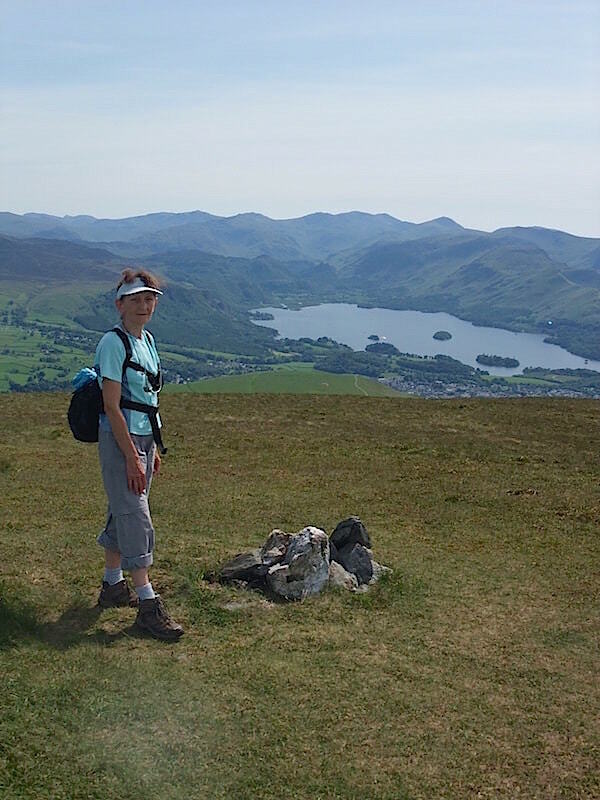 The summit cairn isn’t anything to write home about but the view across Derwentwater makes up for it though, even if things are a bit hazy. That water looks very inviting too, pity its not a bit handier. 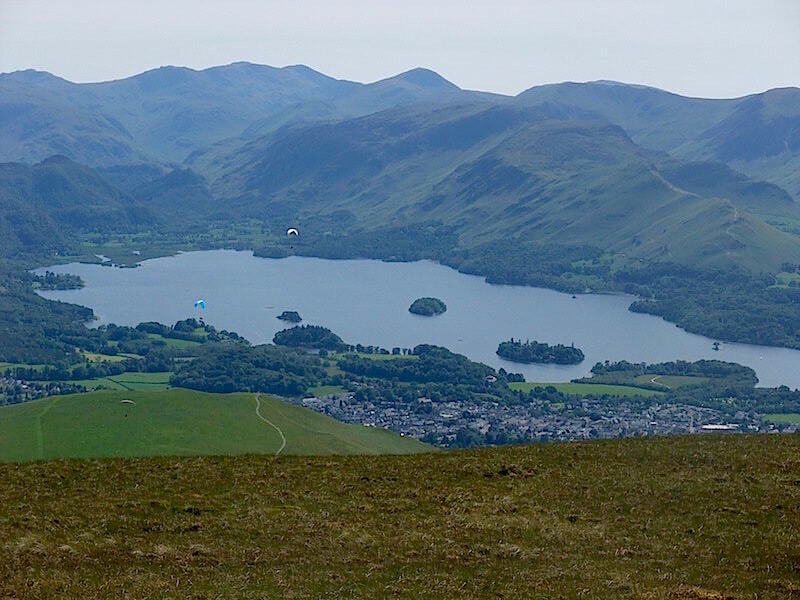 A close up of Keswick, Derwentwater and the surrounding fells plus with three hang-gliders, who are probably feeling a lot cooler than we are at the moment. From Lonscale Fell we made the long plod across the grassy slopes up to Skiddaw from where I took this shot of Long Side and Ullock Pike just below us. 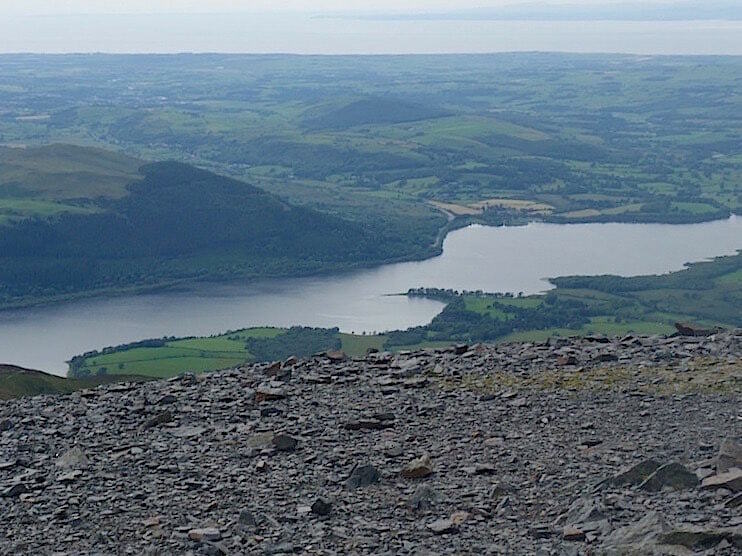 A look down at Bass Lake from Skiddaw. While we were here we met up with the party of schoolchildren and their teachers again. 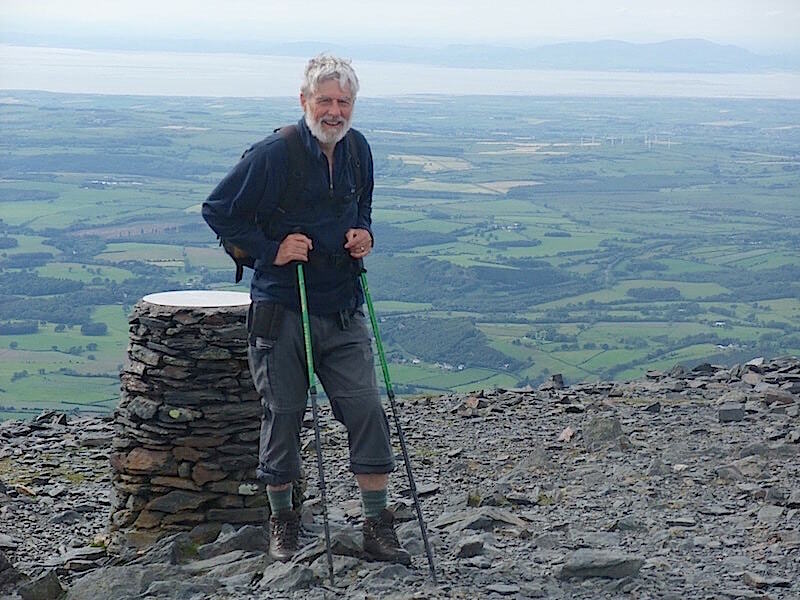 They had off-loaded their belongings at Skiddaw House and then walked up Sale How to reach Skiddaw summit. 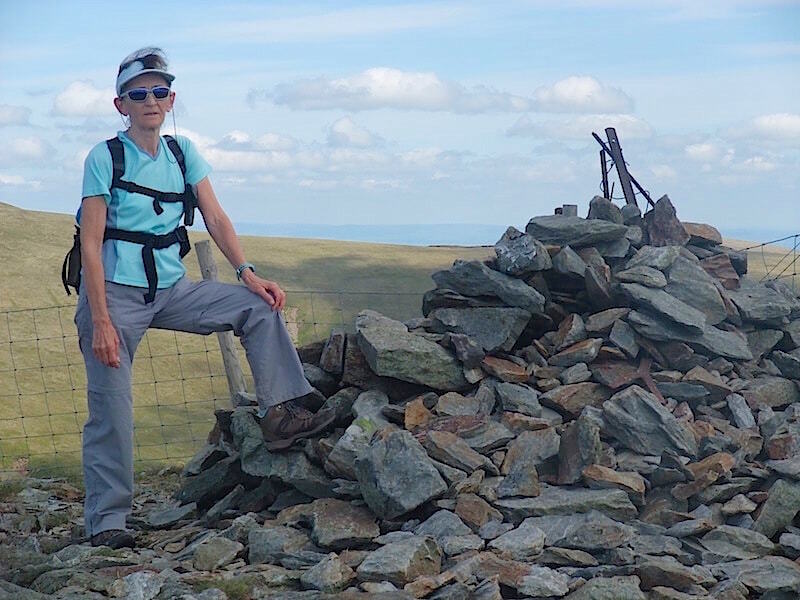 One little girl told me very earnestly that her teacher had said that they should all be proud of themselves for having reached the summit, so I told her that her teacher was right to say that to her because it is the fourth highest fell and it takes a lot of effort and determination to get to the top. One of her classmates looked as though the whole thing had almost been too much for him though. He hadn’t got a jumper or jacket with him, he was shivering in the breeze which had suddenly arrived out of nowhere, and kept close to the teacher, in case he got left behind I suppose. She gave them long enough to have a good look round and then started ushering them back down to the shelter of their night’s lodgings. We also felt the need to add an extra layer up here, even though it was still sunny the heat of the day was starting to go. 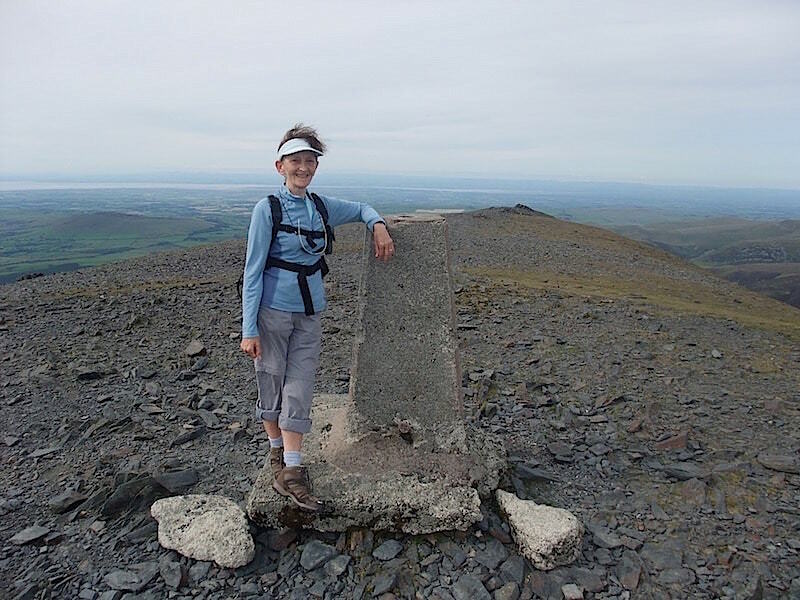 The trig point on the flat Skiddaw ridge, from end to end the ridge must be about half a mile long. The breeze has decided I need a new hair style by the looks of it. 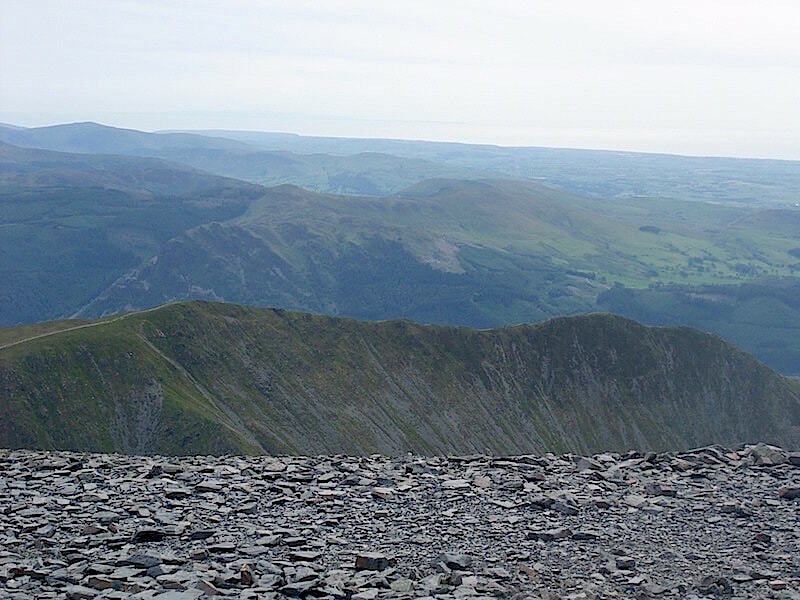 You get a grand view of Blencathra from Skiddaw. A spot of route checking on Broad End, which route do you want to take from here? 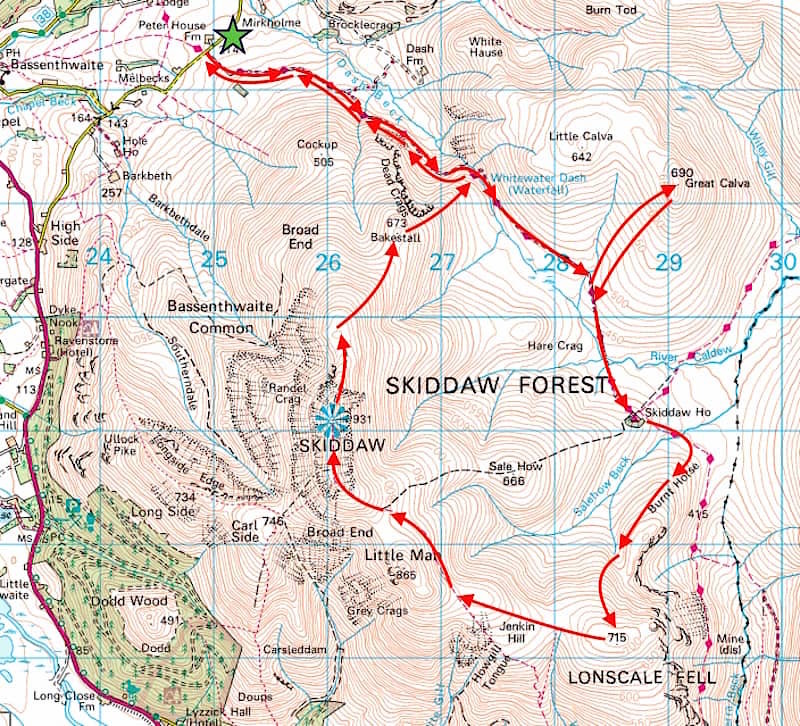 We settle for the direct route off Skiddaw and down to Broad End from where I take a look back up at our descent route. 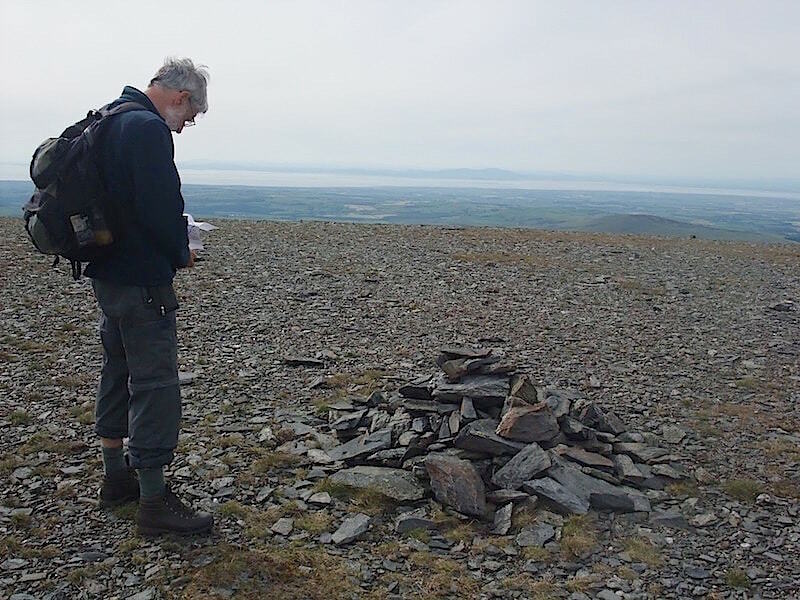 We settled on going back down via Bakestall, so here we are at the cairn on the last fell of the day. Taking time out on Bakestall before we make the steepish descent back to Dash Falls and the walk back to the car. I suppose the schoolchildren are back in Skiddaw House by now and tucking into their tea. Speaking of which, its been a long walk and a long hot day so let’s get a move on and go home for ours.